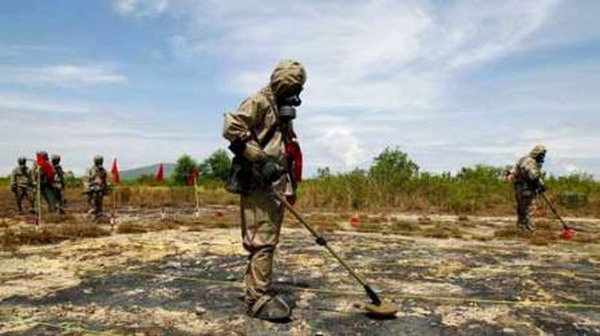 THỪA THIÊN-HUẾ — A workshop was held in the central province of Thừa Thiên-Huế on Monday to look into the outcomes of the trial remediation of dioxin using microbial technology at A Sho airfield in A Lưới District. The event was organised by the Việt Nam Association for Conservation of Nature and Environment (VACNE), the Republic of Korea’s BJC company, and the A Lưới District People’s Committee. VACNE and BJC experts shared the view that the trial remediation was carried out in line with the process, met technical standards for biological treatment, and matched local conditions. Biotechnology is relatively simple technology with low cost, high feasibility and considerable effects in dioxin contaminated land, they noted. The VACNE and Korean partners like BJC, KIT and KIOST have assisted A Lưới District to pilot remediating dioxin-polluted land of A Sho airfield over past years. On this occasion, the VACNE and BJC presented gift packages to more than 30 families with Agent Orange/dioxin victims. They also supported A Lưới District with VNĐ60 million (over US$2,600) to help build a relic site showing chemical war remnants. The US army sprayed some 80 million litres of toxic chemicals from 1961 to 1971, 61 per cent of which was Agent Orange containing 366 kilograms of dioxin, over nearly one quarter of the total area of South Việt Nam.